I joined the Occupational Therapy Department at Ithaca College in 1998, when our first class of students was entering the senior year. I served as Graduate Chair from 1999-2002, and as Chair and Program Director from 2004-2011. My teaching in recent years has included courses related to the assessment and treatment of children (with particular emphasis on working with infants and toddlers and their families), research methods, healthcare and culture, and occupational science. I enjoy research, and have worked with many graduate students in completing their individual theses and group research projects in areas related to primarily to pediatric practice. 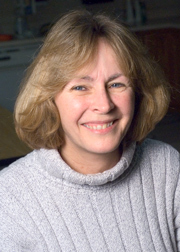 For the past several years, I have been working closely on the Tots on Bots project with Sharon Stansfield from Computer Science, which is focused on the development of a robotic mobility device, designed to provide early movement experience to infants with conditions that may limit independent locomotion. This project is based on research that indicates that independent mobility in infants is associated with developmental growth in perception, cognition, social/communicative functions, and object interaction. Our view, which is shared by many other clinicians and researchers, is that we should provide safe, assistive technology to allow infants with motor impairments to travel independently as early as is feasible. Other faculty who have worked on this project include Helene Larin, Acting Associate Dean of HSHP, and Nancy Rader and Judith Pena Shaff from Psychology. Undergraduate and graduate students have been heavily involved in this project, and have presented results of their work with us at local, state, and national conferences. Our research indicates that pre-crawling infants as young as five months of age can learn to control their movement on the robot, and that they are much more successful with the WeeBot, which is controlled by learning, than with a joystick control. While most of our work has been with infants who are developing typically, we have begun a project working with infants with disabilities, with positive results to date. You can find videos and other information about this project on this page and at this web site: https://www.ithaca.edu/hs/depts/cs/facstaff/sstansfield/totsOnBots/. I also have a strong interest in the effects of culture on health and healthcare. Through this interest I have enjoyed a number of international experiences in occupational therapy, which have included teaching in Sweden, Russia, and England, and leading short-term study abroad courses in the Dominican Republic (2000-2008) and Ecuador (2015-2017). I spent the 2006-2007 academic year living and working in London in the fall (at the Ithaca College London Center) and Buenos Aires, Argentina in the spring. In the summer of 2011 I travelled to Santiago, Chile to participate in a seminar, and Ibarra, Ecuador to join a colleague who works in a clinic in that city. In May of 2012, I traveled to Ireland and Sweden to discuss faculty/student exchange possibilities, and to present professional papers at COTEC, the European occupational therapy conference. I am delighted to welcome prospective students and their parents to the department. I really enjoy sharing information about our program and about the field of occupational therapy, so please call me (607-274-1057)! 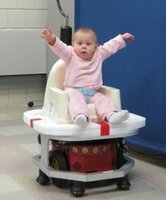 An infant on our WeeBot, designed to provide mobility to infants with disabilities.